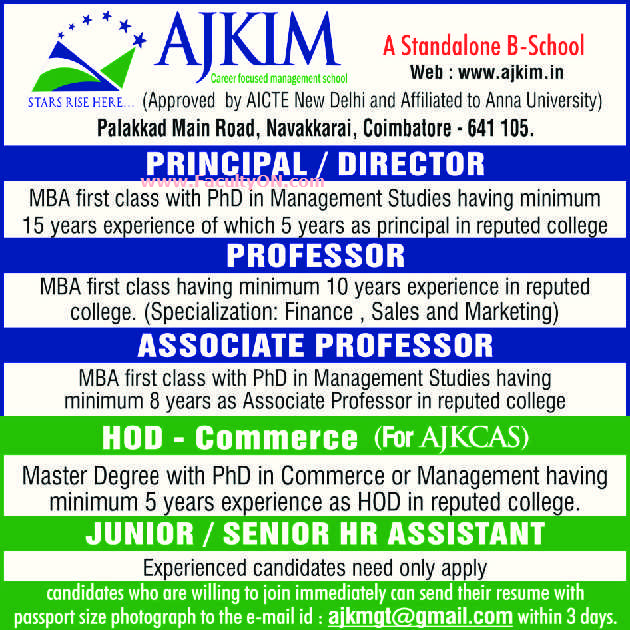 AJK Institute of Management, Coimbatore has advertised in THE HINDU newspaper for recruitment of Professor / Associate Professor / Director / Principal jobs vacancies. Interested and eligible job aspirants are requested to apply within 03 days from 27th June 2018. Check out further more details below. About College: AJKIM strives to inculate the same to their management students. By consistently training their students with industrial exposure, AJKIM is an active institution in terms of conducting seminars, conclaves, events and direct interaction with managerial experts.